Matiangai Sirleaf is an Assistant Professor of Law at the University Pittsburgh Law School. She previously served as an assistant professor of law at the University of Baltimore School of Law, a Sharswood Fellow at the University of Pennsylvania Law School, and as a lecturer for the International Human Rights Exchange Programme run by Bard College and University of the Witwatersrand, teaching courses in international law, criminal law, human rights and transitional justice. Her work focuses on remedying the accountability and responsibility gaps that exist in international law. Her current research agenda analyzes the disproportionate distribution of highly-infectious diseases and the role of law in facilitating this result. The University of Pittsburgh awarded Professor Sirleaf the Chancellor's Distinguished Research Award in 2019. From 2010 to 2012, Sirleaf worked in private practice with Cohen, Milstein, Sellers & Toll in Washington, D.C., where she represented plaintiffs in numerous international human rights cases litigated in federal courts. Prior to that, she served as a law clerk to Chief Justice Sandile Ngcobo of the Constitutional Court of South Africa, as a fellow with the International Center for Transitional Justice, and as a summer associate with Debevoise & Plimpton in New York City, and as a law clerk with the Truth and Reconciliation Commission of Liberia. 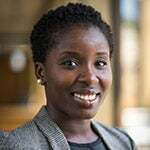 She received her JD from Yale Law School in 2008 and her MA from the University of Ghana (Legon) in International Affairs in 2005. In 2014, she received the Martin Luther King Jr. Humanitarian Award from New York University. Responsibility for Epidemics, 97 Tex. L. Rev. 285-351 (2018). Not Your Dumping Ground: Criminalization of Trafficking in Hazardous Waste in Africa, 35 Wisc. J. Int'l L. 326-366 (2018) (symposium issue). Ebola Does Not Fall from the Sky: Global Structural Violence and International Responsibility, 51 Vand. J. Transnat’l L. 477-554 (2018). The African Justice Cascade and the Malabo Protocol 11 Int’l. J. Transitional Just. 71-91 (2017) (peer-review). Regionalism, Regime Complexes and International Criminal Justice in Africa 54 Col. J. Transnat’l L. 699 (2016). The Truth About Truth Commissions: Why They Do Not Function Optimally in Post-Conflict Societies 35 Cardozo L. Rev. 2263-2348 (August 2014). Beyond Truth & Punishment in Transitional Justice, 54 Va. J. Int'l L. 195, 223-294 (Spring 2014). Regional Approach to Transitional Justice? Examining the Special Court for Sierra Leone and the Truth and Reconciliation Commission for Liberia, 21 Fl. J. Int'l L. 209 (2009). University of Colorado Law School, Boulder, CO (April 2019), Faculty Colloquium Series, presented draft of Racial Valuation of Treatment. University of Connecticut, Storrs, CT (April 2019), panelist on Transitional Justice and Accountability After Mass Crimes at conference on Human Rights and the Politics of Solidarity. University of Pittsburgh, Pittsburgh, PA (April 2019), interdisciplinary workshop sponsored by the Global Studies Center on Defining the Neglected Tropical Diseases, presented draft of Racial Valuation of Treatment. McGill University, Montreal, Canada (Mar. 2019), Margins of Accountability Workshop prior to International Studies Association 2019 conference held in Toronto, Canada discussed next steps for Responsibility for Epidemics project. University of California Los Angeles, Los Angeles, CA (Mar. 2019), panelist on Race, Socio-economic Inequality & Human Rights at conference on Critical Perspectives on Race and Human Rights: Transnational Re-Imaginings, presented draft of Racial Valuation of Treatment. University of Dayton School of Law, Dayton, OH (Mar. 2019), panelist on Global Governance – Reconstruction or Falling Through the Cracks? 2019 Gilvary Symposium, Things Fall Apart or Creative Destruction? : The Future of the Rule of Law in International Governance. Kenyatta University, Nairobi, Kenya (Sept. 2018), keynote speech on Regionalizing International Criminal Law presented at conference on 20 Years Since the Rome Statute of the International Criminal Court – the Status of International Rule of Law, and Access to International Criminal Justice in Africa. Yale Law School, New Haven, CT (Apr. 2018), speaker at a conference on Solidarity: Sustaining the Struggle for Human Rights in a Fractured World, panelist on The Ethics and Politics of Finding Facts and Making Truth. The University of Pittsburgh awarded Professor Sirleaf the Chancellor's Distinguished Research Award for 2019. This award annually recognizes outstanding scholarly accomplishments of members of the University of Pittsburgh's faculty. Junior Scholar Awardees include faculty members who, by virtue of the exceptional quality of their early contributions, have demonstrated great potential as scholars and have achieved national and international standing as an outstanding scholar. Read more here. The University Center for International Studies (UCIS) at the University of Pittsburgh awarded Professor Sirleaf a Faculty Fellowship for AY 2018-19. The purpose of the UCIS Faculty Fellowship is to enable faculty members to undertake projects or acquire skills that enhance the University’s capabilities in some branch of international studies. Prof. Sirleaf will use the fellowship to organize a workshop that will bring together a multidisciplinary group of scholars and students at the University of Pittsburgh and beyond to examine global health inequities in the distribution of infectious diseases as well as prepare a scholarly journal article for publication. Read more here. The University of Pittsburgh awarded Professor Matiangai Sirleaf, Assistant Professor of History Mari K. Webel, and Professor of History and Philosophy of Science, Michael R. Dietrich the Social Science Research Initiative (SSRI) grant for AY 2018 - AY 2019. Their proposal, “Understanding the Development and Impact of Neglected Tropical Diseases (NTDs) – 1950 to Present,” interrogates the concept of NTDs, a category used to describe a set of diseases that highlight health inequities. Read more here. The African Studies Program, at the University of Pittsburgh awarded Professor Sirleaf a Faculty Research Grant for AY 2018 – 2019. The competitive grants are awarded to Pitt faculty affiliated with the African Studies Program to fund research related to Africa. The research grant will be used to fund Professor Sirleaf’s research investigating whether experimental clinical trials during the Ebola epidemic comported with international guidelines. Read more here. The Ford Institute for Human Security at the University of Pittsburgh's School of Public Affairs awarded Professor Sirleaf a research grant for AY 2016 - AY2018 to support her work on global health inequities and the distribution of infectious diseases. The annual competition supports the work of full-time or core non-tenured faculty for research and publication on a human security topic. Read more here. New York University Martin Luther King Jr. Humanitarian Award 2014, presented annually to an NYU alum, faculty, or staff member who embodies and exemplifies the characteristics promoted by Dr. Martin Luther King, Jr.